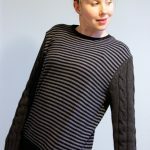 I’ve written about this book a little while ago in this post on how to make a Convertible Blouson Tunic from 3 Men’s Sweatshirts). 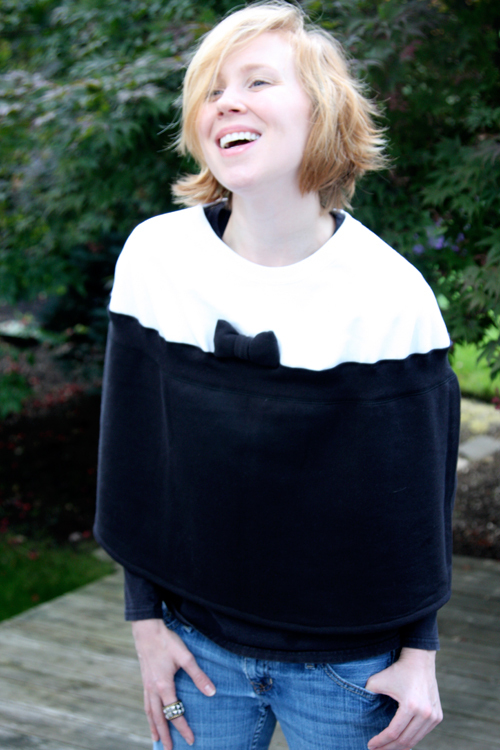 To me, this sweet little cape seems slightly Chanel-ish, two-toned, sleek…anything but sweatshirt-like. 1. 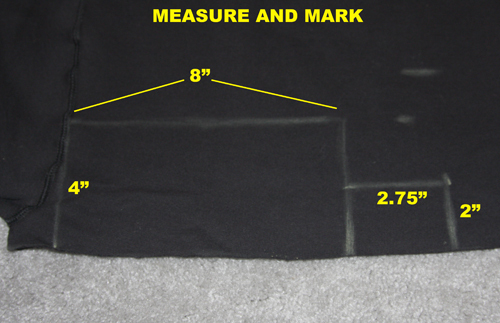 Measure and mark 5.5″ down from the neck opening on your first sweatshirt, on the center front. 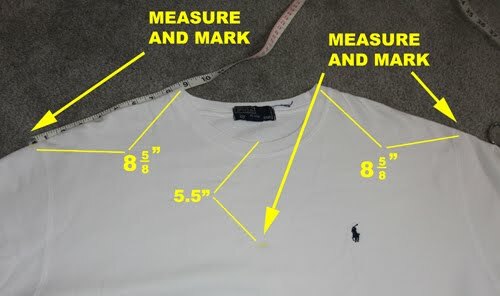 Measure and mark 8 5/8″ on each side of neck opening on the shoulder seams. 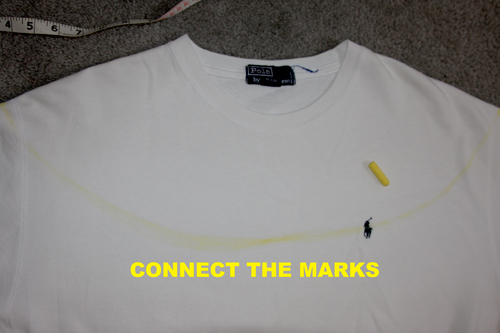 Connect the marks you made in a semicircle around the neck portion of your sweatshirt. 2. 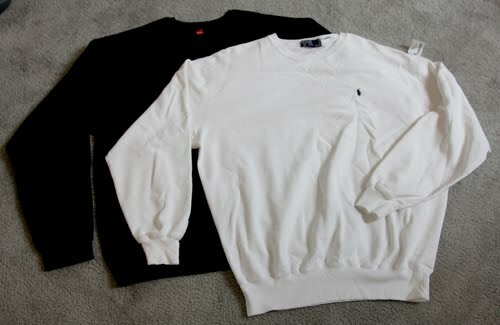 Cut out the neck along the line you made, cutting through both front and back of the sweatshirt. 3. 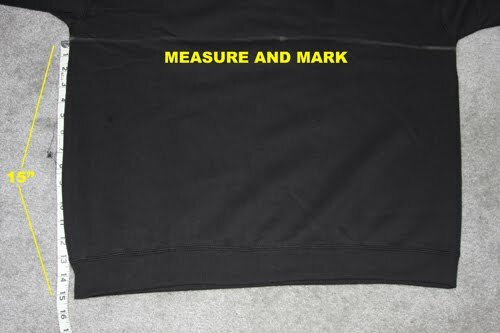 Mark and measure 15″ up from the ribbed hem of your second sweatshirt. 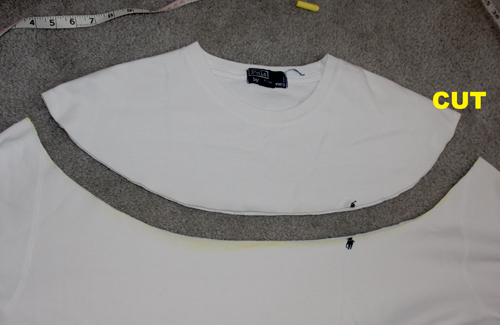 Draw a line straight across the shirt from side to side (it should be very close to right under the arms). 4. 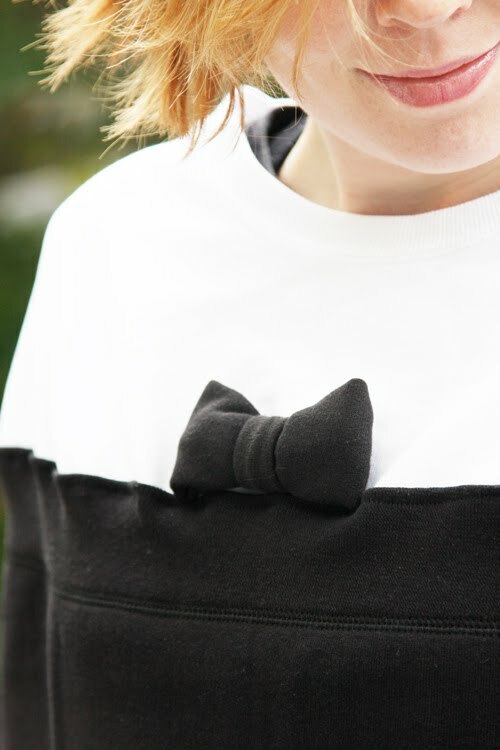 Cut along the line, through both front and back of your sweatshirt. 5. 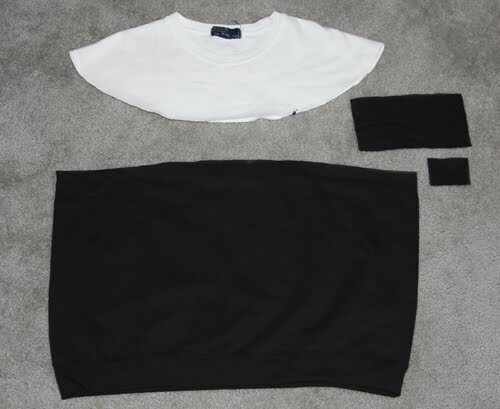 Draw a rectangle 4″ high by 8″ long on the remaining fabric of the sweatshirt from Step 4). Cut it out. 6. 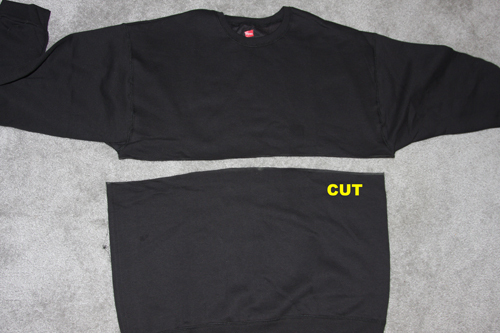 Draw another, smaller rectangle measuring 2″ high x 2.75″ long on the same sweatshirt and cut it out. 7. Turn the 15″-high bottom half you cut out in Step 4) upside down, and pin on top of the cut edge of the neck piece from Step 2). 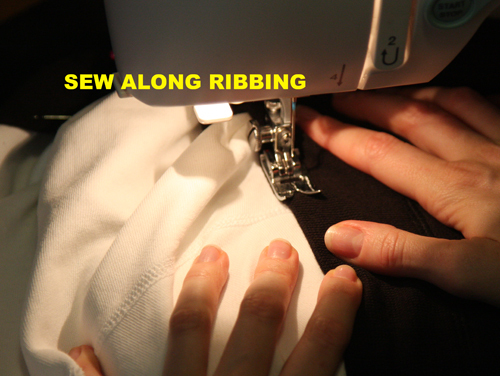 Overlap the ribbed edge about 1/2″ onto the cut edge of the neck piece, following the curved edge. 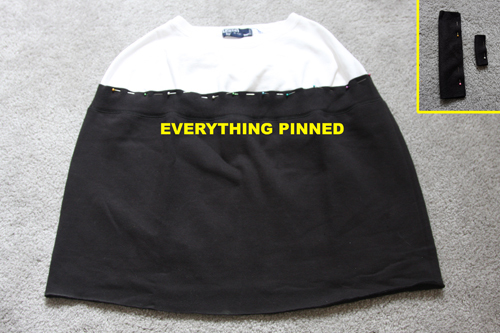 Pin along edge. 8. 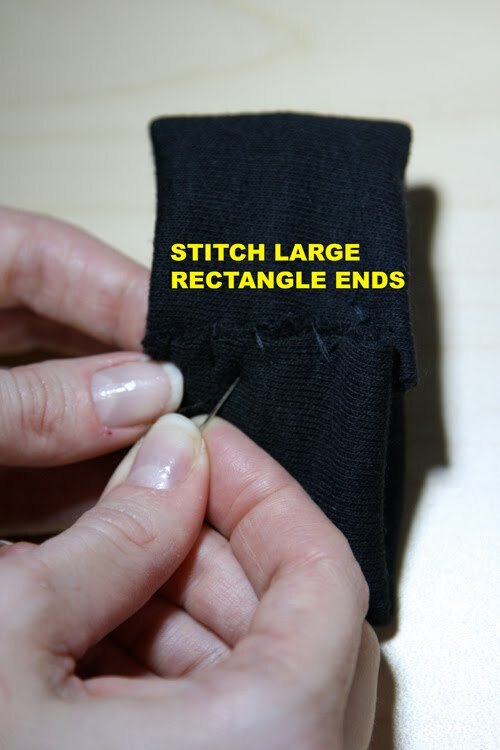 Fold both the smaller rectangles you cut in half lengthwise, right sides together, and pin edges. 11. 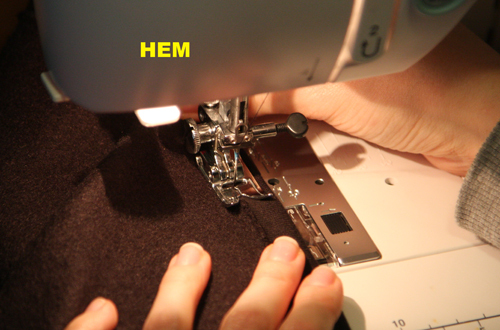 Hem your cape, turning over about 1/2″ at the bottom and stitching a 3/8″ hem. 12. Flatten the larger rectangle tube you made in Step 9), roll the seam to the center, and fold each end over to meet in the middle. 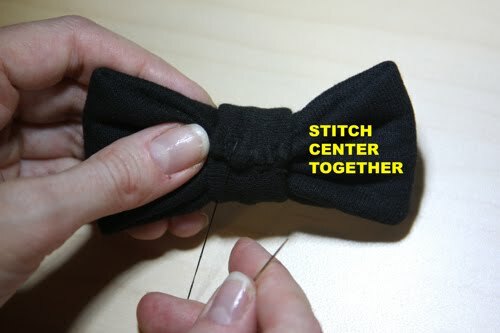 Hand-stitch ends together to make a bow. 13. 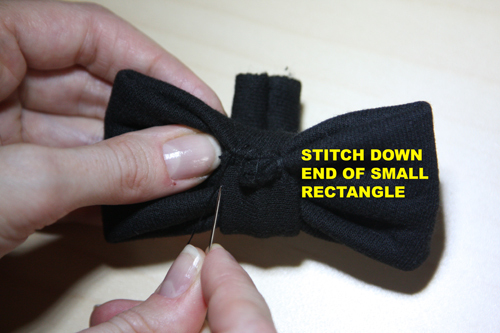 Flatten the smaller rectangle tube, roll the seam to the center, and stitch one end to your stitching in the center of your bow from Step 11). 14. 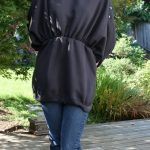 Roll the strip around your bow, pull tight to the back to make your bow “poufy,” and secure in the back again with more stitches. You’re done! 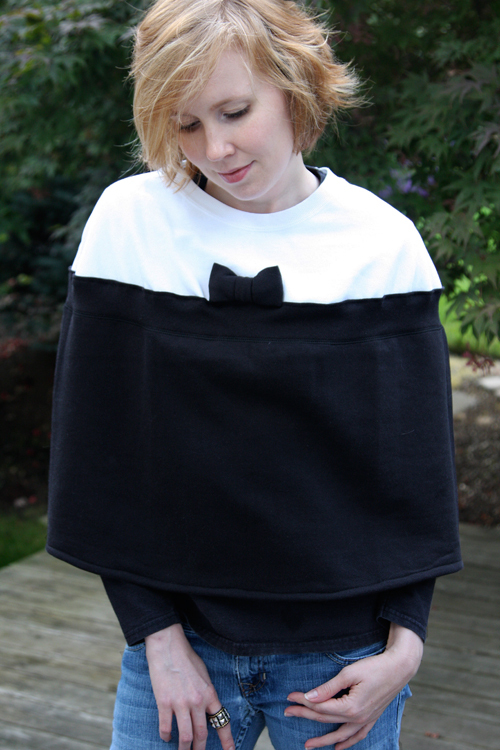 A lovely cape – just in time for cold weather. Really like this post. Are you a designer? It is an online fashion hub that showcases designers such as students to emerging brands. I think you might be interested. CUTE! never would have thought to make one myself, especially from sweatshirts. Love it!